Princess Leia Doughnut Holes are the perfect treat for any Star Wars fan. 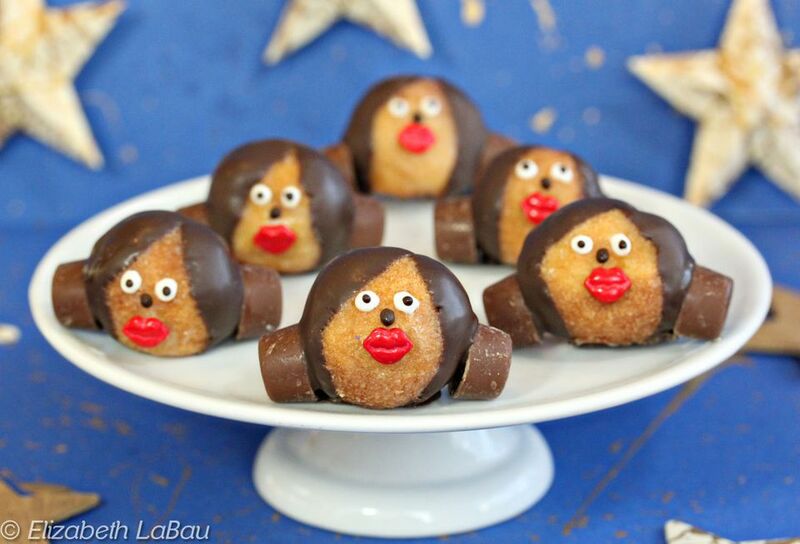 Princess Leia's iconic bun hairdo would be recognized anywhere, but it's still a treat to see it reproduced with chocolate, Rolos, and doughnut holes! You can also use this same idea and make Princess Leia candies using truffles or cake balls as the base instead of doughnut holes. Line a baking sheet with parchment or waxed paper. Place the candy coating in a microwave-safe bowl. Microwave in 30-second increments, stirring after every 30 seconds to prevent overheating. Hold a doughnut hole by the side, and dip it halfway into the coating, so that you have a diagonal line of chocolate cutting across the front of the doughnut hole. Place it on the baking sheet, and press one mini Rolo into the chocolate-covered side of the doughnut hole. Repeat until all of the holes are half-dipped. Refrigerate the tray briefly to set the chocolate, for about 15 minutes. Re-warm the remaining coating, if necessary. Hold a doughnut hole by the Rolo, and dip the opposite side in chocolate, forming a diagonal in the opposite direction that gives the illusion of Princess Leia's parted hair. Place the doughnut hole back on the baking sheet and press a Rolo into the wet chocolate. Repeat until you've finished the hairstyle for all of the doughnuts. Melt the white candy coating, and pour it into a paper cone or a plastic bag with a hole snipped in the corner. Give each doughnut two white dots for eyes. Pour some of the remaining chocolate coating into a paper cone or plastic bag. Dot the center of each eye with chocolate, and give your Leias a dot for a nose. Refrigerate the tray briefly to set the chocolate, for about 15-20 minutes. Because the doughnut holes will get stale, these are best enjoyed the same day they are made, or at least within about 24 hours. To maximize freshness, store Princess Leia Doughnut Holes in an airtight container at room temperature. Click Here to View All Kid-Friendly Candy Recipes! Click Here to View All Cake-Based Candy Recipes! Cute Spring Chick Cookies For Easter! Chocolate Feather Decorations - Make Edible Feathers!